We sent face paints and kids’ cosmetics to the lab to find out what might be lurking in these products. After extensive label reading, we tested 48 Halloween products for the presence of heavy metals and 65 kids’ makeup products—collected by 14 partners across the country—for volatile organic compounds (VOCs). We found the widespread presence of toxic chemicals in cosmetic products marketed to kids. And that’s a fact every parent must be made aware of so they can safeguard kids’ health during the Halloween season and every day. Read the report and take action. Labels listed ingredients of concern, like parabens and formaldehyde-releasing chemicals. Almost half of the 48 face paints tested—21 items—had trace amounts of at least one heavy metal. Some products contained as many as 4 metals. Heavy metal concentrations were higher and more common in darkly pigmented paints. The CDC has made it clear that there is no safe level of lead exposure. 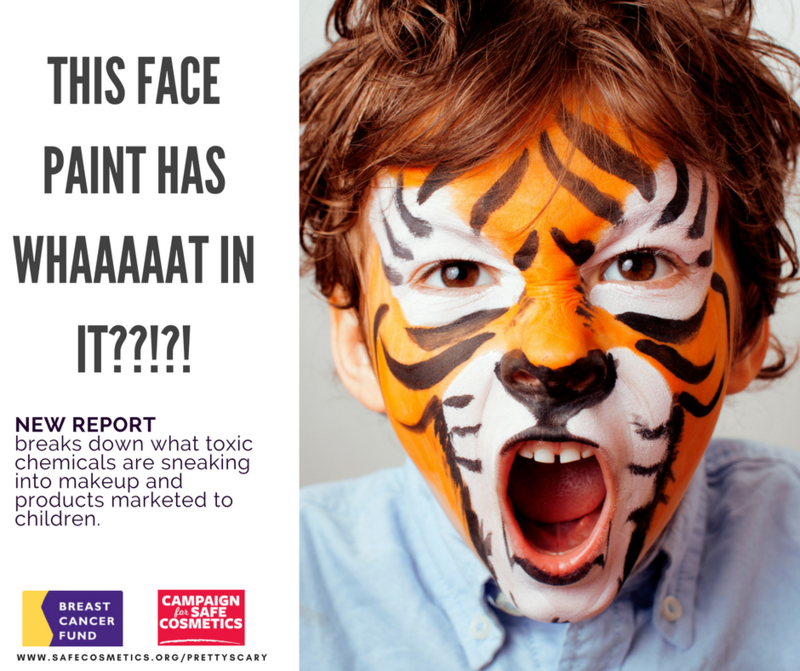 Yet, we found lead in nearly 20% of the Halloween face paints tested. Lead is strongly associated with learning disabilities and developmental problems. We found cadmium in nearly 30% of products. Cadmium is linked to breast, kidney, lung and prostate cancer. Our net takeaway: The presence of these unsafe chemicals marketed to children is of serious concern, especially since children are highly vulnerable to the effects of toxic chemicals during critical windows of development. There are real dangers in children’s products designed for play or daily use. We have long known that the federal law governing the safety of personal care products is inadequate. Chemicals linked to learning disabilities, hormone disruption and breast cancer have no place in kids’ makeup and Halloween face paint! The results of this study clearly indicate the need for strong, health protective, federal cosmetic safety reform to reduce children’s exposure to chemicals from products that on the surface seem playful, but upon scientific analysis pose a dangerous threat to children’s health and well-being. It’s ok to inject metals into their bodies via vaccines, but let’s not put it on their skin.